The Museum of Brisbane is a quirky exhibition space on the ground floor of Brisbane City Hall. It explores quintessential Brisbane people, places and stories through a variety of free exhibitions. Not only does it look at things from the past and present, but envisages our future as well. Exhibitions are rotated regularly and give an interesting perspective on our social history in addition to displaying items from the City of Brisbane’s art collection. The Museum of Brisbane offers free hour-long guided tours on Tuesdays, Thursdays and Saturdays from 11:00am – 12noon. Kids are catered for as well with free art and craft activities on Saturdays and Sundays in addition to a school holiday workshop program. And if you’re interested in unusual objects, visit the museum's Discovery Room and test your local knowledge with trivia in the displays. While there, take the time to climb the City Hall clock tower for a peek at the city skyline from the top. It was once the tallest building in Brisbane and it’s fascinating to see how the city has grown up around this beautiful old sandstone building. 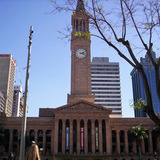 Be quick, though, as Brisbane City Hall will be closing in 2010 for extensive restoration work. Why? Bring Brisbane’s social history to life.